Of course, it’s possible that you’re not much of a flavored lip balm sort of guy or gal. Perhaps a “Looking good for Jesus” shopping bag is more your thing. Or bubble bath, hand cream, coin purse compact mirror and mini kit. If you’re more of a dirty feeling person, you can check out the related line of products called “Wash your sins away” which includes towelettes, breath spray, lip balm and, of course, bars of soap. Unfortunately for our stalwart business person, cautious Christian bookstores were uncomfortable with the pseudo-sexual overtones of the whole thing. They refused to stock the product line, despite an endorsement from a well known Christian Patriarchy leader. Desperate to empty reclaim the use of his third garage stall which was filled with product which had no place to go, the business person was forced to look for other markets. Eventually he found customers among the sort of small boutiques who cater to the “too-cool-for-school” crowd. OK, I totally made that whole story up. Although you have to admit that my “failed evangelization tool” story is shockingly plausible. The truth is I have no idea what on God’s green earth compelled someone to create such a thing. But this is (or at least was a couple years ago) a real product. The tagline for the product line is “Look your Sunday best! Guaranteed to help you be worthy and get noticed by the King of Kings”. Jesus is known and the community has heard him. He is invited to a banquet for further discussion. At such scenes in the traditional Middle East, the doors are open and the uninvited are free to wander in. Jesus and the other guests are reclining on low couches for the meal. Yet in the dynamics of the scene something is missing. . . the accepted rituals of welcoming the guest [foot washing, kiss of greeting, anointing with oil] are not merely overlooked . . . but have been callously omitted by a judgmental host. . . the insult would have been unmistakable. I just love this. 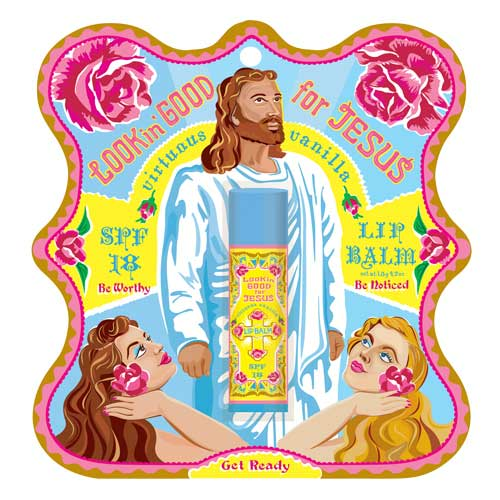 Now, odds are good that “Looking Good for Jesus” was not created by a Christian person. Much more likely, this product line is the result of the same impulses that motivated a man like Simon 2000 years ago. Even before his death, people were already seeking shocking ways to demonstrate that Jesus is inferior, not to be taken seriously or even afforded basic respect. It’s so easy to become indignant and outraged. Yet, how often is that all we do? If this woman had called out her outrage or stormed off in protest, no one would remember her. Instead, she rushes forward to honor, love and serve Jesus. And now she is remembered through the ages. But Jesus provided her with an even greater gift than being known in perpetuity. When Jesus tells her that her sins are forgiven at the end of the story, he also identifies himself with God. Only God has the power to forgive sins. The text notes that Jesus was looking at this woman as he spoke. Happily, there seems to be a growing consensus among many Christians that we need to stop starting fights, boycott or even trying to out-hip those who want to carry on the grand tradition of the Pharisee Simon. No doubt following the example of an impetuous prostitute is closer to what Jesus would want us to do. Carol, I love your quotes. Have you ever thought about starting a blog? I’d follow along! And no, saying “Your sins are forgiven” is not saying, “I forgive your sins,” but “_____ [‘God’] forgives your sins.” It implies more than the usual human level of knowledge, but doesn’t imply that the speaker is making it happen. Oh geeze – The Upside Down World on tour? LOL I hadn’t thought of that! I could get fancy light equipment and hire a band! Ha! I hope that wasn’t what it sounded like – that I’ve got the “start a fancy, high profile celebrity preaching ministry” bug or some such. It has always been my dream to be able to talk directly to people, but I was thinking more retreat or workshop level. But mostly I’m just realistic that (1) a lot more people watch videos than read blogs and (2) I’m a better speaker than writer. I mean – have you seen the random gibberish and grammatical errors I spout off around here?! Maybe I need to re-write my donation page/description. I can get so stuck in my own head sometimes that I don’t always realize how what I’m saying sounds totally different than what I intend. I try not to let that happen, but it does. Bailey is so academic and so hard to read that I always hesitate to recommend him to anyone. He is crazy knowledgable but he seems to feel the need to dump absolutely everything he knows onto the page. It ends up being a lot to wade through to get to a point. But you might be able to appreciate him. He’s totally worth reading and if I were teaching a course on the parables, the book I reference by him would be the main text. The ability to write as if you were actually present and talking to us — as you do — is rarer than you think. Random gibbers & grammatical errors are a side effect… So maybe you won’t be writing Literature for the 22nd Century — but this is likely the time when people most need to be clued in. The honesty, too, is refreshing & unusual. If you belonged to a group of Quakers, we would set you down (if you asked) with what we call a ‘clearness committee’, a group of people charged to help you reach whatever decision you’re called to. If they’re doing this right, they are not supposed to tell you what that might be; but to ask the right questions and let you answer them. Whether there’s a group near enough that would try this with an unfamilar person, well, that seems unlikely… but I wonder what they’d say… Whoever you might ask, that kind of procedure seems called-for.